The 2019 edition of the WSK Super Master Series has officially started this Friday in Adria, Italy. 186 drivers, registered in OK, OK Junior and 60 Mini, have hit the International Raceway for the Qualifying series and the first Heats of this Round 1, facing mixed-weather and track conditions all day long. 544,Dubnitski Mark(EST),Vzeta Racing(BIREL-ART/TM-RACING/VEGA), Adria, 3 February 2019. WSK Super Master Series, © 2019, Alexandros Vernardis / The RaceBox. As for the Champions Cup one week ago, the Italian weather turned to be once again cold and, this time, rather rainy when the three categories went through their on-track duties. Starting from 13:40, the Qualifying series – three for OKJ and 60 Mini, two for OK – have delivered their verdicts ahead of the first Qualifying Heats, with seven races disputed before the chequered flag called it a day around 18:00. On a slippery track, Sebastian Ogaard (Tony Kart/Vortex) set the reference-lap (1:03.229) in his second Qualifying series to clinch the first spot in the Group A. Second-fastest overall, Aleksey Sizov (Tony Kart/TM) will start ahead in the Group B, as will Dexter Patterson (KR/IAME) in the Group C (third-fastest of the class) and Kirill Smal (Tony Kart/Vortex) in the Group D (fourth-fastest). Accredited with the sixth best lap time, Gabriele Mini’ (Parolin/TM) has preceded Dilano Van’t Hoff (Exprit/TM), Kacper Szczurek (Kosmic/Vortex), Sami Meguetounif (Tony Kart/Vortex), Rasmus Joutsimies (Tony Kart/Vortex) and David Rozenfeld (Kosmic/Vortex) in the top ten. Lorenzo Travisanutto (KR/IAME) set the 12th-fastest performance while British favorites Harry Thompson (FA Kart/Vortex) and Taylor Barnard (KR/IAME) concluded their series with the 25th and 30th lap times respectively. Click here for the full results. Racing-wise, Dilano Van’t Hoff secured his first win of the weekend in the A-B Qualifying Heat disputed in heavy track conditions, four full seconds in front of Dino Beganovic (Tony Kart/Vortex) then Aleksey Sizov, Sebastian Ogaard, and Kas Haverkort (CRG/TM). Recovering from 13th on the grid, Harry Thompson crossed the line in 7th before a 5-second penalty (wrong positioning of the front fairing) pushed him back to 8th. After a difficult Qualifying earlier, Taylor Barnard was forced to retire before completing a single lap (full results here)! In the C-D Heat, Kirill Smal won three seconds clear from Sami Meguetounif with Dexter Patterson finishing in third ahead of Lorenzo Travisanutto and Kacper Szczurek (full results here). Did you miss the latest episode of the “RaceBox Show” including a Preview of the WSK Super Master Series? Here it is! Paolo Ferrari (Righetti Ridolfi/TM) made the best of a tricky Qualifying session to set the fastest lap in the Juniors. Nikita Bedrin (Tony Kart/Vortex) pulled off the second-fastest lap (first in Group B) in front of Tymoteusz Kucharczyk (Parolin/TM, first in Group C), Brando Badoer (Parolin/TM, first in Group D) and Robert De Haan (Energy/TM, first in Groupe E). The series, which opened the afternoon in Adria, proved to be difficult for some of the latest Champions Cup’s contenders like Andrea Kimi Antonelli (KR/IAME), 12th overall, James Wharton (FA Kart/Vortex), 24th, or last year’s Final Cup round winner Marcus Amand (KR/IAME), 47th overall. Click here for the full results. The first Heat of the weekend (C-E) went to Tymoteusz Kucharczyk who crossed the line 2.3 seconds clear off Lorenzo D’Aloisio (Birel ART/TM) before the Italian driver was penalized with five seconds (front fairing) to drop back to 6th. Consequently, Robert De Haan gained one place, as Marcel Kuc (Parolin/TM), Paolo Gallo (Parolin/TM) and Alessandro Cenedese (Parolin/TM). A distant 24th on the grid, Laurens Van Hoepen (FA Kart/Vortex) recovered half of the positions in 12 laps (full results here). The following Heat (B-D) was the scene of a double drama when the two front row drivers, Pole-sitter Nikita Bedrin and Brando Badoer, retired in the first lap after hitting each other! 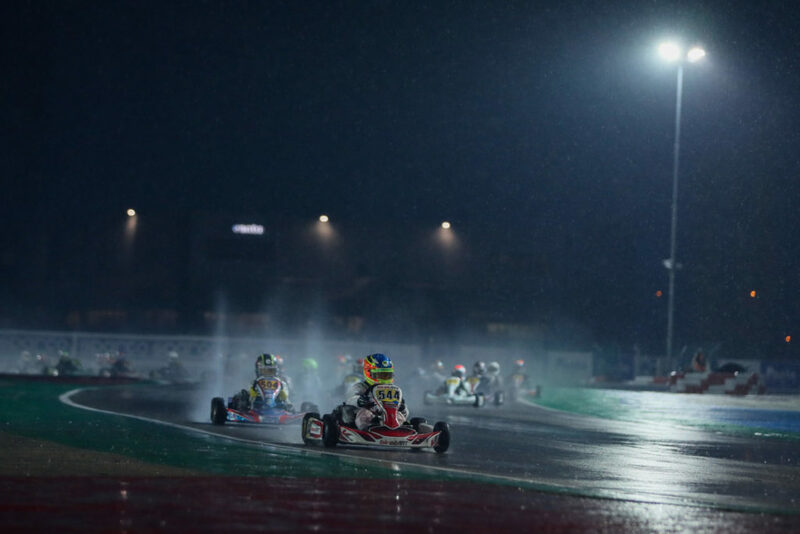 A situation that led to Josep Marti Sobrepera (Tony Kart/Vortex) taking the win with Andrea Kimi Antonelli completing his run in second place ahead of Conrad Laursen (FA Kart/Vortex), Martinius Stenshorne (Parolin/TM) and 2019 Champions Cup Winner Alex Dunne (Exprit/TM) (Full results here). At ease with the track conditions, Coskun Irfan (Parolin/TM) topped the 60 Mini class in Qualifying with a lap completed in 1:09.954 to secure him the front seat in the Group A. Manuel Scognamilgio (Tony Kart/TM) was second-fastest (first in Group B) ahead of Maksimilian Popov (first in Group C, Parolin/TM), Francesco Marenghi (first in Group D, Tony Kart/TM), Mark Dubnitski (first in Group E, Birel ART/TM) and Kirill Kutskov (first in Group F, Energy/TM). Rashid Al Dhaheri (Parolin/TM), on the podium last Sunday, faced a troublesome session with the 33rd lap time, as Douwe Dedecker (Parolin/TM), 60th, and last week’s Champions Cup Victor Andrea Filaferro (Tony Kart/TM), 77th. Click here for the full results. In the opening Heat of the day, William Macintyre (Tony Kart/Vortex) defeated Pole-Sitter Coskun Irfan, who kept his second place despite a three-second penalty for non-respect of the starting procedure. In third place, Mikkel Pedersen (Parolin/TM) produced an interesting effort by making up nine places ahead of Tom Braeken (Parolin/TM) and Kajetan Gawron (Parolin/TM). Third and fourth on track, Gabriele Garozzo (IPK/TM) and Yaroslav Trukhin (Energy/TM) were classified 6th and 8th after both being penalized with a 5-second penalty for front fairing (full results here). Despite starting 11th, Rashid Al Dhaheri flew through the field to win the C-D race 0.8 seconds from the Pole-sitter Maksimilian Popov. His fellow countryman Maksim Orlov (Parolin/TM) came home in third, in front of Julius Dinesen (Parolin/TM) and Loris Clericy (Parolin/TM). Second and third on the grid, Fransceco Marenghi and Alex Powell (Energy/TM) couldn’t do better than 17th and 19th respectively after some trouble on the way (full results here). Finally, the Qualifying Heat between Groups E and F was won by Kirill Kutskov (Energy/TM) ahead of Joel Bergström (Parolin/TM), Mark Dubnitski, Anatoly Khavalkin (IPK/TM) and Alexandr Tibekin (DR/TM) (Full results here). The Round 1 of the WSK Super Master Series continues this Saturday with the first Warm-ups from 8:20 and the pursuit of the Qualifying Heats from 10:20 (see below). To help you follow the event, click here for a day-to-day Live timing (brought to you by Apex timing). Live Streaming (provided by WSK Promotion) will also be available on this website for the Prefinals, Finals B, and Finals on Sunday. Click here to read our Preview with exclusive photos taken on location. We are also on Facebook, Twitter, and Instagram. Click here for the fully-detailed schedule.